What it says above. I’ll be walking 60 miles in October and I am trying to raise $3000. You can donate by clicking the “DONATE” button above. When I was a kid in school, my parents both worked outside the home. They hired babysitters to be at our house when I arrived home from school. I vaguely remember the Puerto Rican girl who loved “I Love Lucy,” but I loved Mrs. Elmer. Mrs Elmer took me ice skating at the Aud, taught me how to take the bus almost anywhere in the city, drew me into Girl Scouts, and was a wonderful person. She had a double mastectomy and was killed by cancer in the late 1970’s. I was so upset when she was sick and in the hospital that I was rude to “Aunt Nellie” who Mrs. Elmer had found to take her place. I have no idea how I was rude, but I remember being grounded for a week. I have learned that 1 in 8 women will be diagnosed with breast cancer during their lifetime. I rather expect to be one of them. Ten years ago, I had a scare. My doctor found a lump in my breast and said I had to see a surgeon. I was seeing an old male gynecologist, and he was very unhelpful and nobody answered my questions at his office, except to tell me that the recommended surgeon was wonderful. The recommended surgeon was wonderful, as was the nurse practitioner who worked with her, who held my hand as I had a needle biopsy done. The biopsy found no malignancy, but it did find papillary cells, which have been shown may develop into cancer. So the lump, a fibroadenoma, had to come out. Before I had surgery, two lumps were identified in one breast and one in the other, and all were removed. A couple of years later, I had another (surprisingly fast-growing) lump removed, and my new, younger, female OB-GYN decided I ought to have annual mammograms. So I have been having them since before I turned 35. 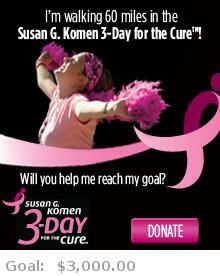 Susan G. Komen For The Cure is a charity that is very highly rated on Charity Navigator, earning 4 stars (the maximum). They funded the research that led to the discovery of the BRCA1 gene (breast cancer gene) and are currently funding research into early detection and into preventing metastasis (probably why Mrs. Elmer died), among other areas of research. This charity has raised $1.2 BILLION since Nancy G. Brinker promised her sister Susan G. Komen that she would do everything in her power to end breast cancer forever. Please click on the “DONATE” button above and give what you can. If you are able, $500 or $100 would be wonderful. If you are stretched thin, $20 or $15 would be wonderful. I’m going to train, walk 60 miles and raise $3,000. What will you do? This entry was posted on 3 March 2010 at 7:36 pm and is filed under free advertising, life. You can follow any responses to this entry through the RSS 2.0 feed. You can leave a response, or trackback from your own site.